This Australian Polyrhachis (Campomyrma) has lined its galleries with a fine wood pulp. I took this photograph last month in southern Australia. In the field, I was far too focused on the ants and their larvae to notice the carton substrate. At least, not right away. But once aware of it, I saw that every nest I uncovered had the pulp wallpaper. This unusual use of organic matter likely provides the benefit of being better insulated and less prone to flooding or drying out than bare soil. The structure may also be a type of carton, meaning it also holds a connective fungus, but I was unable to find any published literature confirming it. In any case, ant nests themselves can be just as surprising as their hosts. additional reading: Robson, S. K., & Kohout, R. J. (2007). A review of the nesting habits and socioecology of the ant genus Polyrhachis Fr. Smith. Asian Myrmecology, 1, 81-99. More nature documentaries like this, please. At noon, winged ants amass at the nest entrance in my front yard. As a sign of how prolonged the 2013-14 winter has been, the Prenolepis imparis winter ant mating flights did not occur here in Urbana until yesterday. That’s April 10th. The last time I photographed Prenolepis flights was in 2012- the same colony- and the ants flew a whole month earlier, on March 12. I took a break from the email backlog (sorry! I know some of you are waiting on things from me, but it’s been a busy, busy month) to shoot the action. I hope you enjoy this batch of photos. The queens and males climb nearby grass blades and some clumsily take to the air. Several queens are divebombed by incoming males- I presume from other colonies- and mate near their natal nest. Anelosimus studiosus, adult female (center) with two juveniles. A highlight of my recent excursion to the University of Texas at Austin was learning about some little spiders, Anelosimus studiosus, that spin messy webs in the undergrowth. Remarkably, these spiders are communal. Most arachnids are solitary predators, but Anelosimus studiosus lives and hunts in shared webs. These social tendencies render Anelosimus exactly the sort of spider that might lure an ant biologist. And of course, that is how I happened to hear of them. UT’s famous ant-fungus lab, the one headed by Ulrich Mueller, has a student, Emma Dietrich, working on the spiders. Emma was kind enough to collect a few webs from around campus for me to photograph. Anelosimus studiosus is typically subsocial- meaning that young spiders remain with their mother in the web but disperse at maturity- but populations in colder parts of the range are properly social, with multiple breeding adults sharing webs. I had always thought of spider sociality as a tropical phenomenon. I observed another species of Anelosimus, for example, on my last trip to Ecuador. But social spiders right here in the temperate zones of the United States? Fantastic! A male Anelosimus studiosus can be identified, like most spiders, by the “boxing gloves”- the enlarged secondary genitalia on the pedipalps. source: Furey, RE. 1998. Two cooperatively social populations of the theridiid spider Anelosimus studiosus in a temperate region. Animal Behaviour 55, no. 3 (1998): 727-735. Ant larvae are fascinating. I wish more studies of ant behavior included them. Gnamptogenys striatula, Belize, eating fire ant carcasses. While not as flashy as adults, immature ants are just as important to the functioning of a colony. Not just for the obvious reason that all ants must grow up from larvae, either. It’s that larvae are the gut of the colony. 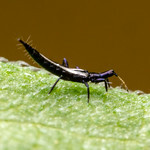 Larvae are the only individuals that can eat solid food. Adults can’t pass solids through their extremely narrow guts. Yet protein-rich foods, like arthropod carcasses, are typically meaty. So if an ant colony is to use these resources, the larvae must digest them first. In most species, the grubs can then regurgitate a liquid protein slurry back to the adults. Anyway, this post is really just a long-winded excuse to share the above photograph of charmingly furry Gnamptogenys larvae making quick work of some fire ants their older sisters have brought them. A few weeks ago I mentioned my discovery, just down the road from my house, of a Formica field ant species I’d never seen before: Formica vinculans. This active little ant is a prairie specialist, and I was surprised to find a healthy population in downtown Urbana. We’ve lived in our present house for several years, and these had somehow escaped my notice the whole time. I should have suspected these little ants would host parasitic ants I’d also never seen. And so they do! Last week I chanced across a raid by the social parasite Formica gynocrates, spilling across the sidewalk with their mandibles full of F. vinculans pupae. Formica gynocrates are one of many so-called “slave-raiding” ants that benefit from the labor of ants taken as immatures from the nests of other species. 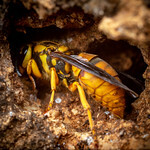 I didn’t have my camera with me for the raid, but I returned later to capture a few photographs at the parasites’ nest. Formica vinculans (left) with its Formica gynocrates social parasite. A remarkable aspect of ant taxonomy, even in well-studied faunas like our midwestern one, is that many species are still essentially unknown. Formica gynocrates was not formally described until 1985.